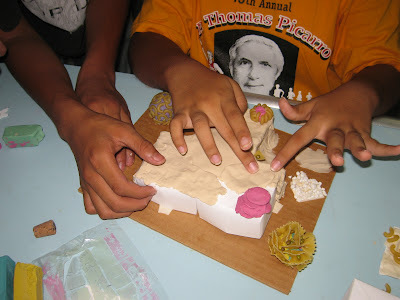 The last three days of the Beautify CNMI Micronesia Challenge Summer Camp flew by. As I type this on Saturday evening, I can't believe that it is over. Oh well, coming from a life long Boston Red Sox fan, there's always next year...and the students are already asking us to make it two weeks, instead of just one week, long. Thursday ending up being our longest day. The day started at 7 AM. 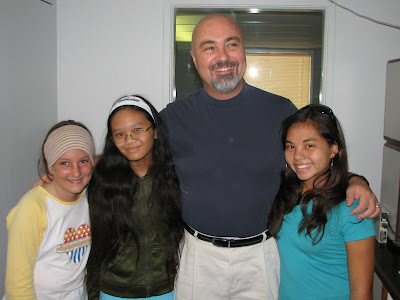 Two of the students, Bree, and I appeared on the Harry Blalock Island Issues radio program to talk about our camp. We were on the show for about 20 minutes and Harry grilled the two students, Sami and Zoe, about the things they have learned this week. He also helped us record environmental public service announcments after our interview. Then I also wanted to spend a little time talking about a group of bright young students Angelo Villagomez and Bree Reynolds brought in to my studio Thursday morning. 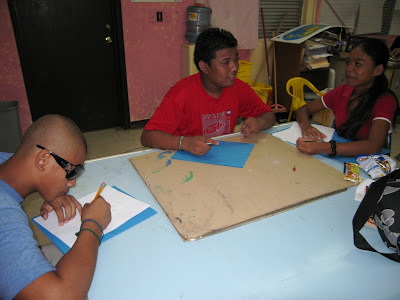 They are part of the Beautify CNMI Marianas Challenge Summer Camp, being put on by Angelo and Bree. These students really are learning about our environment, and what they can do to help protect it. I made sure they've learned something by grilling them with questions on Island Issues. Sami and Zoe totally impressed me with what they've learned and their passion about it. The only thing that caused me any concern at all was that Sami was just way too relaxed and good on the radio. I'm afraid she could replace me in a heartbeat if she wanted to, my only consolation is that she's just going in to the 9th grade this coming year, so my job is probably safe for a couple years anyway. 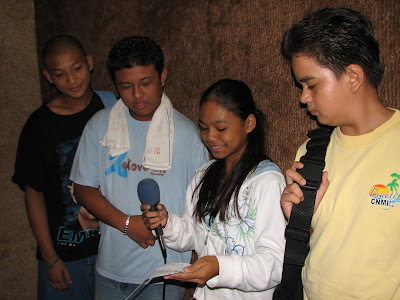 Part of what they did in this camp was to write public service announcements from what they have learned to air on the radio stations. 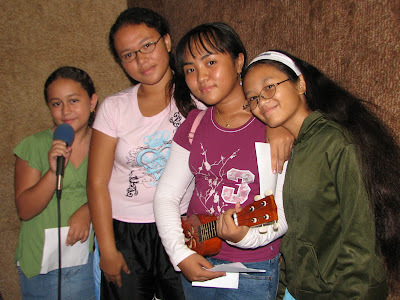 Some of them even wrote an original song about beautifying the CNMI, they wrote the words and music. They came in with their ukelele and recorded the song in my production studio. I've got to say, I absolutely love it! You'll be hearing a lot of that song and those psa's in the coming months on both of our radio stations. What a talented group of students, and something tells me these are our leaders of tomorrow. 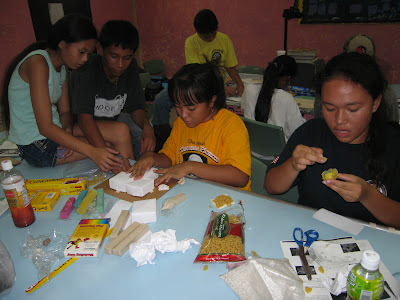 If you'd like to see some of the pictures from their summer camp, and learn what it was all about, you can go to the www.greencnmi.blogspot.com website and read all about it. Tasi Tours deserves a big thank you for donating a van and driver to help transport the campers all week to their various places. And after hearing from the students on the air, Ed Salas of Tan Holdings Corporation called up donating Shirleys lunch for all the campers that day. They had talked about how the camp was being run on a shoestring budget and they were just making do with whatever they had, so Ed called up on behalf of Tan Holdings to give them a break from peanut butter or bologna for lunch. Many thanks go out to all the various people in the community who chip in to make amazing events like this happen. And while you could technically say this was job related for Angelo, Bree is a science teacher at Hopwood Junior High School, and is supposed to be on summer vacation right now. But she loves what she's doing so much, and loves the students so much, that she donated her time to help put on this summer camp. I think I can forgive him for calling the Micronesia Challenge the Marianas Challenge. After several hours at the radio station we returned to Hopwood to finish up work on the coral reef models and the wastewater science projects, which led right into lunch provided by Shirley's Coffee Shop and Tan Holdings. We also worked out some of the logistics for Friday's field trips to American Memorial Park and Managaha. After lunch we had about 30 minutes before we left for our afternoon field trip, so Bree had the students play a couple of games based on communicable diseases. In the first game they were given a series of clues and a map of a city suffering from disease outbreaks. Using the clues, they had to determine what disease people were contracting, how the disease was being spread (water borne, etc. ), and the source of the disease (the water pump on Broad Street, etc.). Then Tasi Tours picked us up at 1:30 and took us to the CUC Waste Water Treatment plant in Sadog Tasi...or as I like to call it, Wave Jungle II. Our tour of the facility started in the lab. 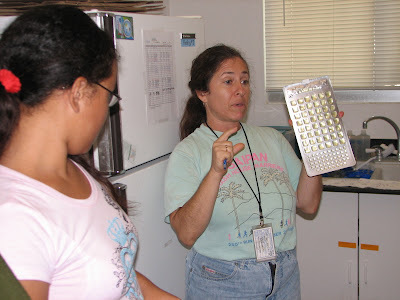 Heidi showed the students the lab and showed them how they check for bacteria in the water. 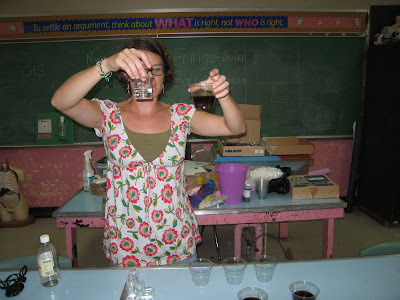 We also asked Heidi to talk about becoming a lab chemist for a career. She told the students that they had to be good at Math. 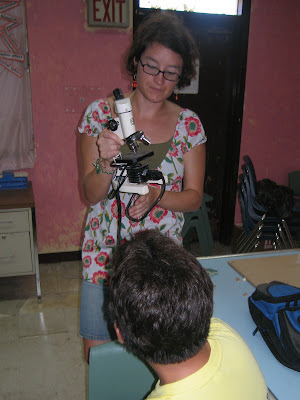 After letting use a microscope and showing us the different ways that CUC tests the effluent water, Heidi took us to the Brown Jacuzzi. Ew. This is where CUC "cleans" the water. 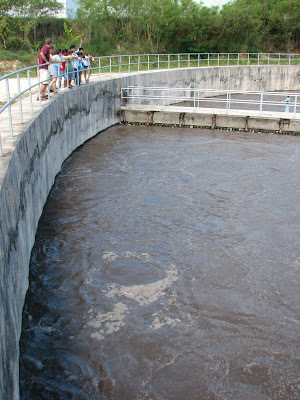 Using a process that I would only screw up if I tried to explain, CUC gets rid of all the solids and then dump the remaining liquids into the lagoon. Yum! While we were contemplating joining the "Swim Club," some other CUC employees joined us. This led to one of the best moments of the camp. Heidi asked one of the guys if there was anything he wanted to tell the kids. Without hesitation he responded, "well, kids, please don't flush your underwear down the toilet. You wouldn't believe the kinds of things we find: Shoes, underwear, even cellphones." I'm probably going to repeat that story for the next five years. Mylene wrote about Day 4 on her blog, Mylene Rocks. I've got pictures and stories from Friday and Saturday morning, but I haven't uploaded the pictures yet. Come back tomorrow for an update. If the post isn't up by tomorrow, just keep waiting. The CNMI Mental Health Planning Council presented me with a beautiful plaque earlier this morning in "Appreciation and Recognition for his Public Services, Volunteer Work and Advocacy in Improving the Lives of Individuals with Mental Health Disability, and most especially for Children with Special Needs." My name is Steve Nguyen. 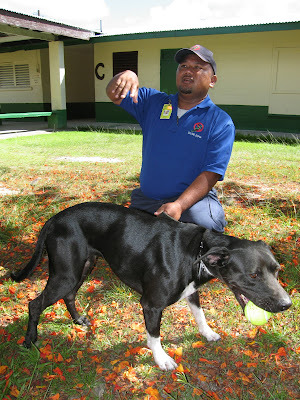 I work as a Behavior Specialist for the public school system here in Saipan. In the process of trying to find some help for a young man and while discussing and collaborating with a fellow member of the Mental Health Planning Council named Kaye Christian, an idea came to my mind to start a mental health awareness group here in the CNMI! We've all heard about how a few passionate people started Beautify CNMI, a group of concerned citizens, groups, and government agencies united to enhance the CNMI's natural beauty and foster community pride. They picked up trash and are doing a great job cleaning up the beaches. Beautify CNMI is doing its part to make our environment healthier, cleaner, and more beautiful. In this same spirit, we're going to start a mental health awareness group to clean up and wipe out the myths and stigmas that plague mental illness. We want to be the Beautify CNMI of mental health! Drawing inspirations from...Beautify CNMI (environment)..., we are going to follow in the same footsteps set by Beautify CNMI and do the same thing for mental health that Beautify CNMI is doing for the environment! We will call this new group CAMI-CNMI (Coalition on the Anti-Stigmas of Mental Illness in CNMI). By uniting the powers of VOLUNTEERS from the community and from various agencies like PSS, Clubhouse, NMC, DYS, CGC, DPS, NMPASI, etc. we can and will ignite a mental health awareness revolution here in the CNMI! So the short version is that I would like to share this award with the group that inspired me to create CAMI-CNMI. 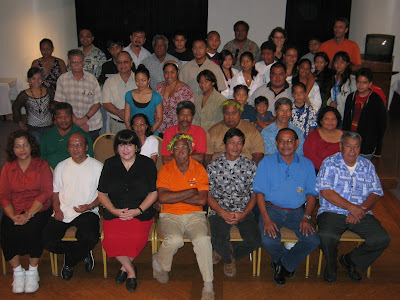 And CAMI-CNMI led to other projects and ideas. So while Beautify CNMI was "spreading the beauty virus", I was working feverishly to help spread the "let's rid the CNMI of the stigmas of mental illness" virus. I'm proud to have been a part of an on-going effort to develop local-capacity in training service providers and serving those with mental health needs and especially children with special needs. This plaque given by the Mental Health Planning Council (MHPC) honoring my contributions to serving and advocating for individuals with mental health disability and children with special needs is validation of the efforts and partnerships of many people and agencies to serve those with mental and academic challenges. Bree, Sami, Zoe, and I appeared on the Harry Blalock Island Issues show yesterday morning. We talked about the camp and what we've been doing all week. The girls did a great job on the show. They impressed Harry so much, that he even wrote about them on his blog. Mylene and Sami: Pick That Up! This morning we were visited by Marja and Tony from Division of Fish & Wildlife’s Brown Tree Snake Program. 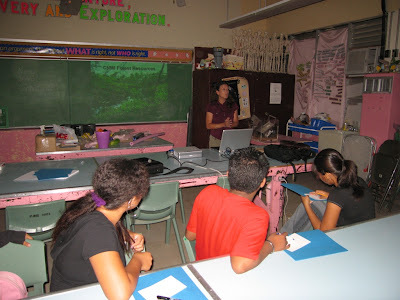 They gave a power presentation on the history and current operations of the Brown Tree Snake Program in the CNMI. They also brought two snake dogs. Mina is a two year old pit bull/Labrador mix. 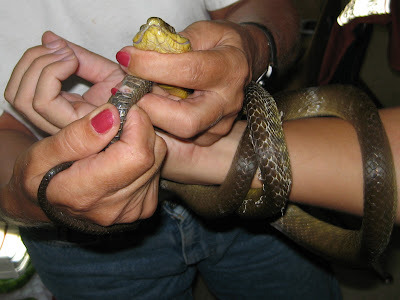 During a demonstration, Mina was able to find a snake hidden in a bucket…twice! 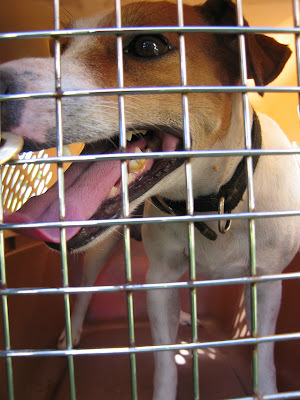 Jack is a Jack Russell Terrier. The students hid a snake in a bag in the classroom and Jack was able to find it in seconds. Tony and Marja worked with the kids for over two hours. Thank you so much, Tony and Marja! The students really appreciated the time you spent with them. After the snake team left we worked on our environmental PSAs. PSA time led right into lunch...Baloney and mayo sandwiches! Yum! After lunch, using a microscope, the students drew models of the different parts of a plant cell, talking about the differences between a plant cell and an animal cell. 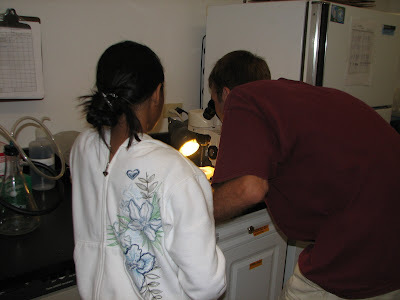 They looked at plant cells under a microscope and drew sketches of what they saw. Pretty good, huh? This is a fringing reef. 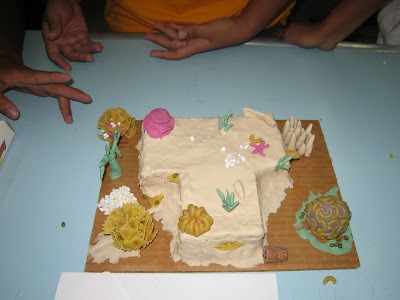 The other two groups did a coral atoll and a barrier reef. 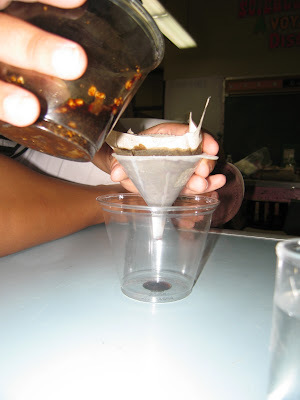 Then as a preview to our Wastewater Treatment Plant field trip scheduled for Thursday, we did a waste water experiment where we gave the students sand, baking soda, vinegar, cotton, coffee filters, and paper towels. We gave them wastewater made from peanut butter, soy sauce, coffee, onions, leaves, beans, and another assorted fun things. The students had to return the pH of the water to 7 and take out all of the coloring until it was clear. The day ended before we finished this experiment, so we put everything aside to finish the next day. Finally, Mylene and Hope both wrote about Day 3 on their personal blogs. Keep up the blogging, girls! THREE local fishermen discussed traditional fishing methods during a workshop at the Pacific Islands Club yesterday. The workshop, spearheaded by the Children of Our Homeland Center, aims to educate the public on traditional fishing techniques which, according to assistant project coordinator Anicia Q. Tomokane, not only help conserve marine resources but also promote the local people’s cultural identity. Funded by a grant from the Administration for Native Americans, the whole-day workshop was also sponsored by Northern Marianas College’s Cooperative Research Extension and Education Services and the Joeten-Kiyu Public Library. Traditional fishing, according to one of the presenters, Stan M. Taisacan, is something that has not been practiced for the past 40 years. Taisacan, who represents Rota on the Commonwealth Council for Arts & Culture board of directors, discussed the “achuman technique” of gathering fish. It is done with a use of poiu, a device made of stone and coconut shell, and young coconut meat as bait. “This one is better in conserving marine resources because with this method, you will get only what you need,” he said. And it is not difficult to catch fish when one masters the technique, he said. Lino Olopai, a Carolinian culture lecturer, shared his knowledge on traditional fish traps. He demonstrated the use of ull wall osch, a woven fish trap used for general reef fish; the breadfruit leaf kite used to catch “needlefish without the use of a metal hook; and the use of coconut shell with line and bait to catch flying fish. Artist, Chamorro historian researcher and lecturer, and experimental archeologist, Noel B. Quitugua, discussed traditional tools and fishing implements. Jack Ogumoro, the CNMI coordinator of the Western Pacific Regional Fishery Management Council, acted as moderator in the workshop. He said they are now trying not only to talk about traditional fishing but also practicing it. Traditional fishing should now be incorporated into modern management tools for the conservation and protection of marine resources, he said. 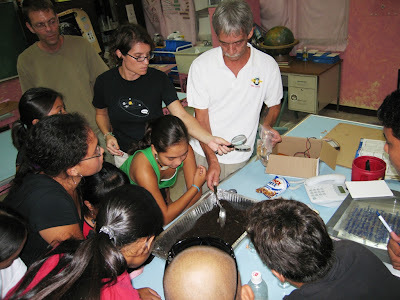 Dr. Teny Topalian, coral reef ecologist of the National Oceanic and Atmosphere Administration’s Pacific Island Regional Office, discussed how traditional fishing techniques help promote the preservation of marine biodiversity and cultural diversity. Mylene also talked about Day 2 on her blog, Mylene Rocks. I have to give a huge thank you to the businesses that supported the Beautify CNMI Micronesia Challenge Summer Camp. Tasi Tours offered to drive the students around to our different field trips all week FREE OF CHARGE. PSS does not have money to pay for gas, so we were extremely lucky that they are so generous. We also owe a huge thank you to Ed Salas and Tan Holdings. Mr. Salas heard us on the Harry Blalock Island Issues radio show this morning talking about how we are running the camp on a shoe string budget. On Monday we had P&J sandwiches for lunch, on Tuesday we had the dollar menu at McDonalds, on Wednesday we had baloney and mayo, and due to Tan Holdings generosity, we feasted on Shirley's today. Tan Holdings gave us $100 worth of food! Thank you, Tan Holdings! Go visit Shirley's at the Thursday Street Market and at the Liberation Day Carnival. Thank them for me! 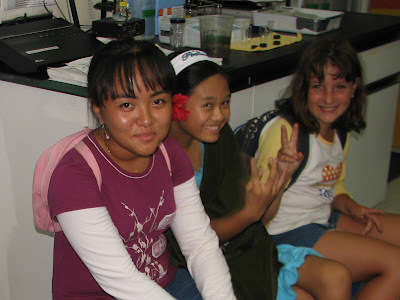 Mylene and Hope have written about the Beautify CNMI Micronesia Challenge Summer Camp on their blogs. Mylene wrote about Day 1, Day 2, and Day 3 and Hope wrote about Day 3, which was her first day at the camp. I have already posted a report for Day 1. Reports for the rest of the week are forthcoming. The seventh name looks like "Katy." I'm sorry, but I can't read the handwriting and there is no last name. Who is Katy? Is it you? 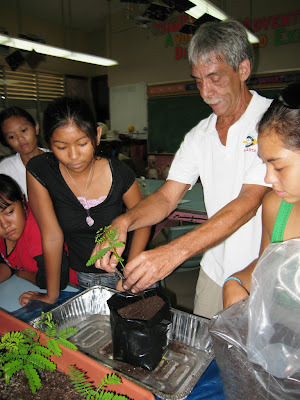 The goals of the Beautify CNMI Micronesia Summer Camp are to introduce kids to conservation issues, the Micronesia Challenge, and environmental careers. We had a very successful Day 1. Kathy Yuknavage, Natural Resource Planner at CRM and MINA Secretary, helped us kick off the week long camp by making a presentation on the terrestrial portion of the Micronesia Challenge. She talked to the students about the 20%, how much land the CNMI already has in protected areas, and how much of that land is in forested areas. She also made a presentation on the Walk It, Don’t Drive It Campaign. The students learned about the different reasons not to D.R.I.VE. on the beach: Driving on the beach Drips oil, creates Ruts, Impacts the sand, and kills Vegetation. After the presentations by Kathy we did an energizer/ice breaker. We played boffer tag. Our first activity was an experiment to determine how many germs are on our hands when we eat. We took a slice of bread and had someone handle it who hadn’t washed their hands. We put the bread slice in a zip lock bag and put it aside. 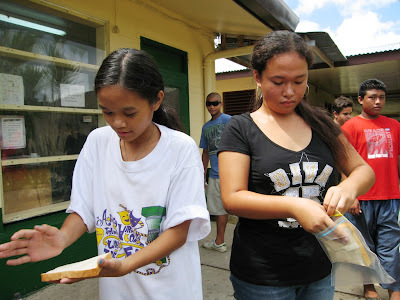 We repeated this with slices of bread that had been handled by someone who had washed their hands with water only, who had washed their hands with soap and water, and who had washed their hands with hand sanitizer only. We also repeated the experiment with someone who had used soap & water, but who had only lathered for 10 seconds, 30 seconds, one minute, two minutes, and three minutes. We'll take a look at them again on Friday. We are going to record some environmental PSAs for the local radio station on Thursday. We gave the kids some time to start writing them. Some of the students are writing scripts, some are writing songs, and others just wrote first person dialogues. 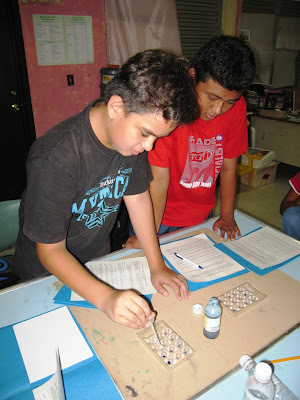 Then we used a chemistry kit that taught the kids about the scientific method. It came with known and unknown chemical liquids that when mixed, changed color. The students mixed the known liquids and made observations of the changes. Then using those results, they tried to determine the content of the unknown liquids. 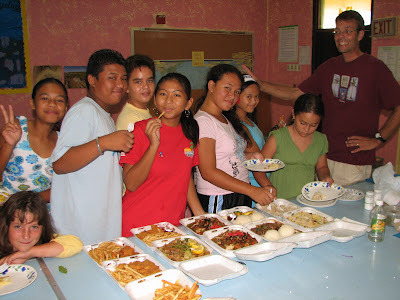 In typical Beautify CNMI fashion, lunch was provided on a shoestring budget. We fed the kids P&J sandwiches, apples, and water. After lunch, Brad Doerr, a MINA member and local retiree, came in to talk to the students about tree care & propagation. 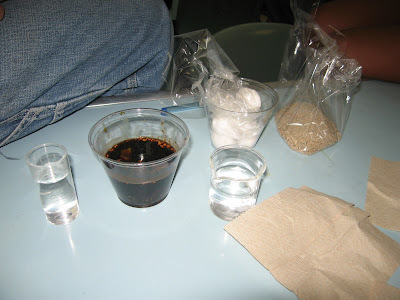 He brought in different samples of soil, showing them the difference between sand, clay, limestone, and organic soil. He showed the kids how to plant a seed, showing them how seeds can be many different sizes. He also brought in some month old Flame Tree saplings and showed the students how to transfer trees from a smaller pot to a larger one. He also showed them how he uses organic waste to create compost at his house in As Matuis. After lunch we had a few more energizers (stolen from the clubmates at PIC) and then did a project on watershed pollution. Bree laid out four large sheets of white paper and then drew a non-linear line down the length of the paper, separating what would eventually be land and water. 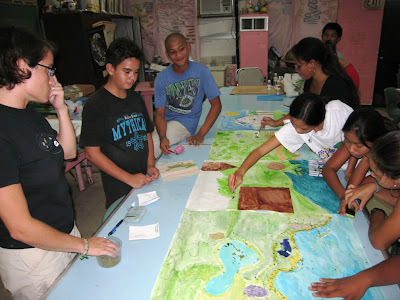 She broke the students into four groups and had them paint on the ocean and the land, painting in the type of development they would like to see on the land. 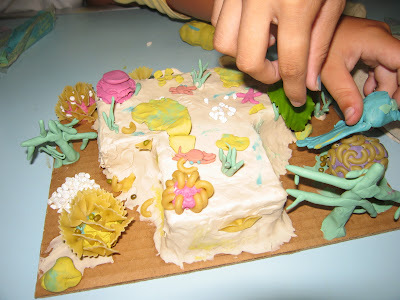 The students drew houses, agriculture, roads, hotels, ponding basins (! ), pastures, and even a horse farm. When they were finished we put the four posters back together and discussed how the different types of development would affect the marine environment and how one poster would affect the others. 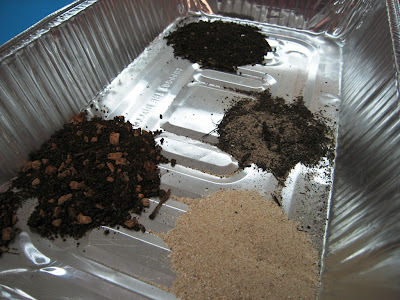 The kids were able to identify that the agriculture would result in pesticides and fertilizers running into the water, that the roads would result in erosion and increased runoff, and so on and so on. Mylene also wrote about Day 1 on her blog, Mylene Rocks. Beautify CNMI's Environmental Challenge Camp. It's an environmental camp with a purpose. Chalk full of field trips, service projects, and fun. For students entering 7th grade and up. Call Bree at 237-3477 or Angelo at 483-1078 for more information. This camp is sponsored by Beautify CNMI, S.A.V.E., and MINA. 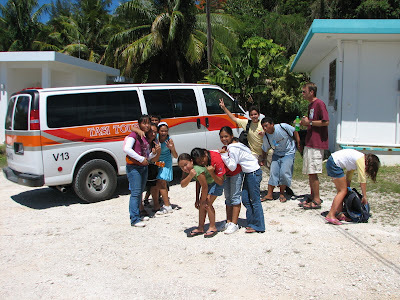 Tasi Tours is providing transportation for the students. 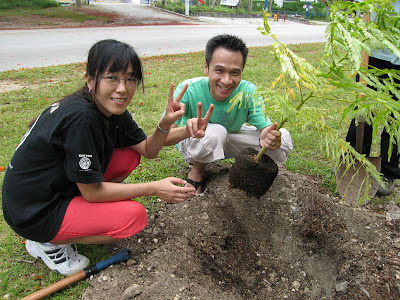 Thanks for adopting a tree, Steve and Miwa! We are sure going to miss you guys! Don't miss the Grand Opening of the Koblerville Youth Center & 1st Family Fun Night! EVERYONE IS INVITED!!! Come one and all to this first ever Family Fun Night. This event will be held every Friday. There will be food, entertainment, outreach info, plus you'll be helping fundraise for all the Youth Centers as 10% of gross receipts will be donated to the Youth Centers courtesy of Mr. Jeff Santos. THANK YOU, JEFF! Yesterday, as part of my internsip with Beautify CNMI, I helped Angelo coordinate the press event for the one year anniversary of Beautify CNMI's first tree planting. We planted 5 Flame Trees and the event was attended by the media and several volunteers and partners. *Prepare any supplies that might be needed for the event, such as tools, chairs, tables, drinks, food, sound systems, etc. *Call the media and let them know about the event. *Write a Press Release and send it to the media. *Call the media and ask to speak to the reporter who will be covering your event. *Set up any sound systems, tables, chairs, coolers, or anything else that is needed for the event. *Have photo ops set up and ready for picture taking. *Call the media to remind them about the event. MARIANA Islands Nature Alliance executive director, Angelo Villagomez says unskilled bush-cutters are the flame trees’ worst new enemies, compared to typhoons and the fungus Phellinus noxious. Recent typhoons have toppled flame trees along Beach Road and other areas on Saipan while Phellinus noxious is responsible for killing several flame trees along Airport Road and four other places on island. 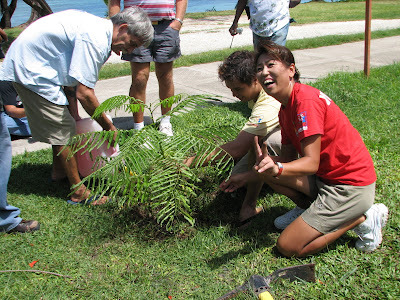 Villagomez, together with Rep.Cinta Kaipat, Covenant-Saipan, were among the Beautify CNMI! volunteers who planted flame trees along Beach Road yesterday morning in celebration of the first anniversary of the coalition’s tree planting activities. 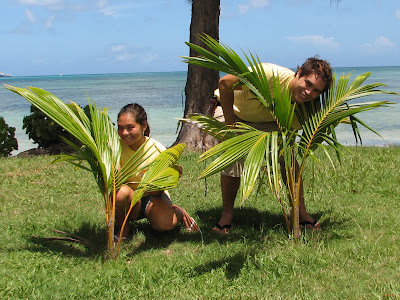 Among the 2,000 native trees that Beautify CNMI! has planted since last year are 27 flame trees. At least 83 people who have adopted flame tree seedlings will join the coalition in planting 150 more flame trees, Villagomez said. Flame trees killed by improper trimming have recently become a concern of the Marianas Resource Conservation and Development Council, MINA and Beautify CNMI! A tree trimmer training workshop was conducted recently. During the tree planting yesterday morning, Villagomez showed how bush-cutters harm newly planted flame trees. He pointed to an affected portion of a young flame tree that was hit by a bush-cutting equipment due to carelessness. He said there is a need to educate the people performing bush-cutting jobs. Newly planted flame tress must be protected from careless bush-cutters, he added. Ken Kramer of the Marianas Resource Conservation and Development Council said they want to replace the flame trees that were killed by the fungus, but not in the areas where the soil is still infected with the fungus. Eleven infected flame trees along Airport Road will be cut down. At least 10 percent of the 600 flame trees planted on Saipan in 1978 have already been killed by this fungus which can be dormant for many years. Brad Doerr, MINA’s organic gardener who grows flame trees, said the affected soil has to be sterilized before planting new flame trees which take 10 years before they can bear flowers. Those who also participated in yesterday’s flame tree planting were Capt. Carl Brachear, Isa-CNMI’s Aya Matsumoto, Walt Goodridge, Julian Aguon, Joyie Lam and John Griffin, a visitor from Pennsylvania. MARKING A MILESTONE: Ken Kramer of the Marianas Resources Conservation & Development Council plants the first Adopt-a-Flame Tree sapling during the kickoff the Beautify CNMI tree planting for 2007 on Beach Road Tuesday morning. The planting was done in celebration of the first year anniversary of Beautify CNMI's tree planting drive. 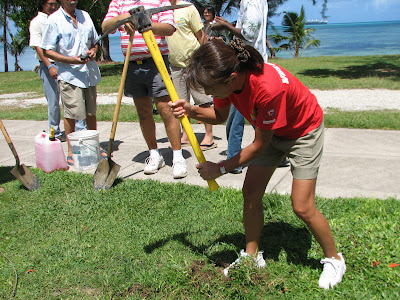 The hardworking volunteers and members of Beautify CNMI, MRC&D, Rep. Cinta Kaipat's Office, Isa CNMI, and Mariana Islands Nature Alliance planted five trees yesterday, replacing trees damaged by typhoons, bushcutter, or disease over the years. The strategy above, and the questions which follow can be used by anyone who wishes to participate in the New Saipan. 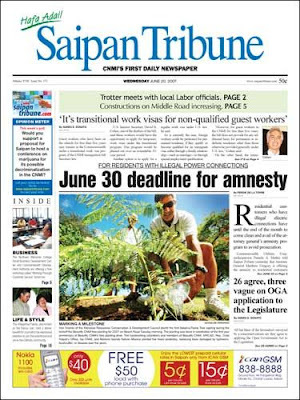 What is your vision of what a new Saipan can look like? What’s your ideal scene? What can be improved? What can you do to be a catalyst for change? How can you get the ball rolling? How can you encourage or inspire others to bring about the change you envision? The best way to change the world is to be the change you’d like to see, and lead by example. What can you do to show others how it should be done? In this time of distraction, it’s not enough to simply respond to change, it is important that your response be documented and exposed. This is vitally important, because without adequate documentation and coverage, people are left at the mercy of fear-based, passivity-inducing, daily "news" that neither empowers nor appropriately informs. How can we expose our efforts and accomplishments to the greatest number of people? BeautifyCNMI!, concerned about the appearance of this island, took matters in their own hands and envisioned, sparked, led and continue to document the change on their website (www.beautifycnmi.com). 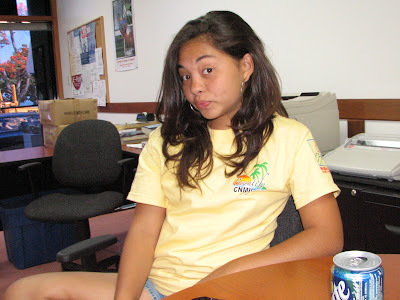 Beautify CNMI has a summer intern! Samantha Birmingham Babauta just graduated from Hopwood Junior High School and is the Vice President of Student Action for a Viable Environment. Earlier this spring she played soccer with NMIFA's Women's League. She played for the Grand Hotel Mean Green Striking Machine, captained by Morgan Rose. Later this summer she will play for The CNMI's Greatest Coed Soccer Team EVER, Brad & Angelo's Guns & Roses! 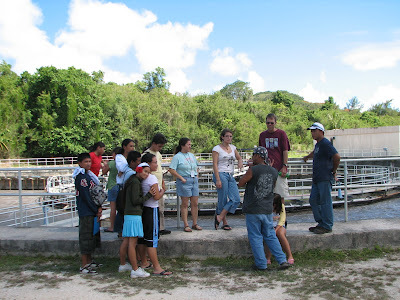 She is learning about the exciting work of the people who coordinate Beautify CNMI! In the first week of her internship she was placed in the office of Rep. Cinta Kaipat. Sami worked side by side with Representative Kaipat, following her to meetings, answering phones (learning telephone skills as she went), receiving official Legislature documents, running errands, and participating in and helping with the School Crisis Response Workshop by Steve Nguyen. 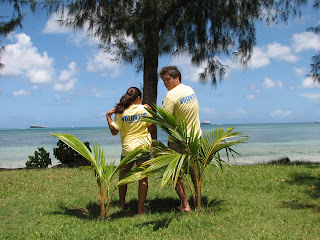 Sami and Angelo: These two trees are the 1000th and the 1001st trees planted by Beautify CNMI in 2006. This week she is stuck with me, Angelo Villagomez, Executive Director of MINA. I'm teaching her about event planning, volunteer coordination, earning media, environmental issues facing the CNMI, student activism, and how to plant a Flame Tree. I'm also teaching her really cool ways to take pictures with trees. 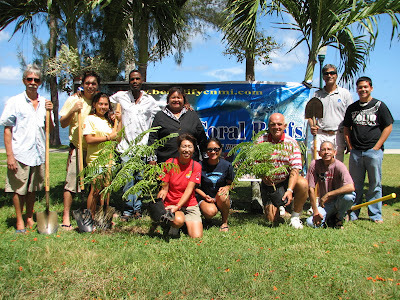 Community volunteers and adopt-a-tree patrons (from left to right): Brad Doerr of MINA, Angelo Villagomez, Sami Birmingham-Babauta, Beautify CNMI summer intern, Walt Goodridge, Rep. Cinta Kaipat, Aya Matsumoto of ISA CNMI, Joyie Lam, Captain Carl Brachear, John Griffin, Ken Kramer of Marianas RC&D, and Julian Aguon. This morning Beautify CNMI partners from Marianas Resources Conservation & Development Council, Rep. Cinta Kaipat's Office, Isa CNMI, and Mariana Islands Nature Alliance helped kick off the Beautify CNMI tree plantings for 2007! We planted 5 trees, replacing trees that have been removed because of typhoon damage, bushcutter damage, or disease over the years. 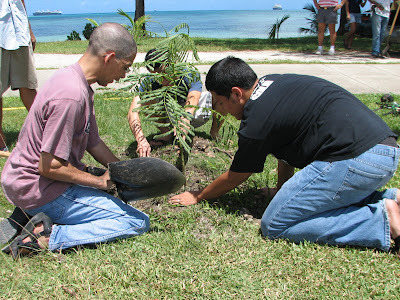 The planting occured on the one year anniversary of Beautify CNMI's first tree planting. Exactly one year ago we planted four Flame Trees on Beach Road. Some of those Flame Trees are over 10 feet tall today. Is the tree tall or are the people short? : Angelo Villagomez, Sami Birmingham-Babauta, and Steve Nguyen. This tree was planted on June 19, 2006. It is only one year old. 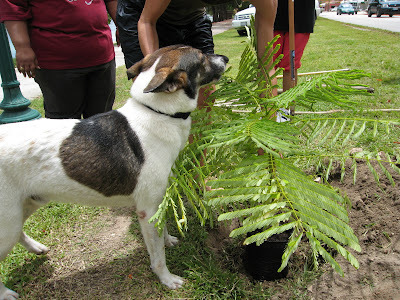 That planting kicked off a series of tree plantings that resulted in the planting of over 2000 native trees. 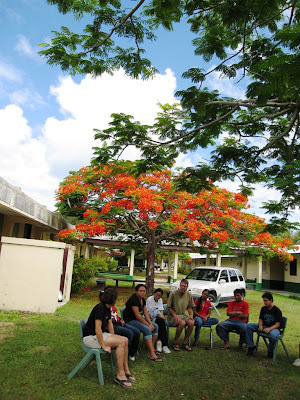 The Flame Trees planted this morning are a part of the Beautify CNMI Adopt-a-Flame Tree program. Anyone can adopt a Flame Tree. 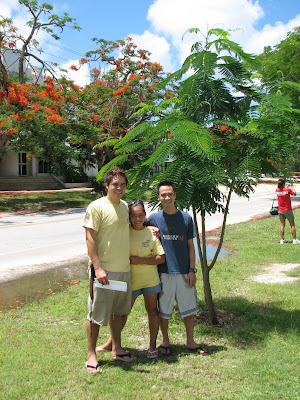 The cost is $20 and the adoptee can plant the tree with Beautify CNMI or at their home. Adoptees will recieve a certifcate of adoption that has the GPS coordinates of their tree. Their tree will also be featured on the Beautify CNMI website. 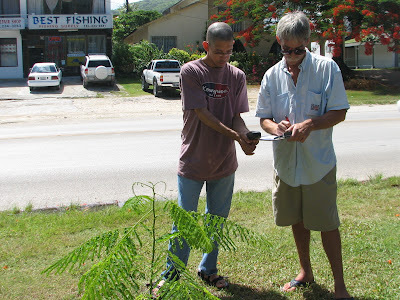 GPS All-stars: John Griffin and Brad Doerr take the GPS coordinates of a Flame Tree. If you would like to adopt a tree, please contact Angelo Villagomez or use the DONATE NOW button to make a donation. The cost is $20 per tree. 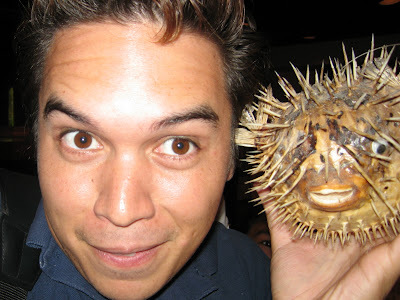 Julian Aguon and John Griffin are both visiting Saipan this week. Julian is from Guam and John is from Pennsylvania. When they heard about our tree planting this week, they both decided to adopt a tree. We only had five trees at our kickoff event, so they decided to plant it together. Later in the rainy season we will plant another tree for them. 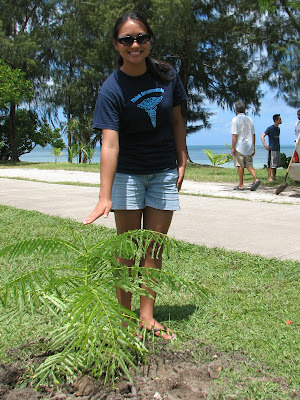 Joyie Lam came to this morning's tree planting after reading about it on one of the many Saipan blogs. She decided to adopt a tree. Joyie, who is entering her third year at Pepperdine University, planted this tree for her and her best friend, Rika, who is currently attending college in Japan. Rika is the daughter of Aya, who has also adopted a Flame Tree.